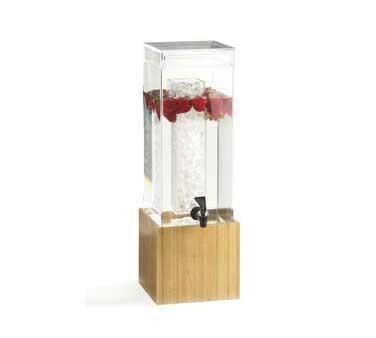 An excellent addition to any restaurant, hotel, or breakfast buffet, the Cal-Mil 1527-1-60 Bamboo Acrylic Beverage Dispenser with Ice Chamber 1.5 Gallon provides a stylish and eye-catching beverage service. Boasting an attractive bamboo base, this eco-friendly dispenser adds visual flair to any food venue setting. The stylish, premium quality dispenser is designed with a crystal-clear acrylic tank that beautifully displays colorful punches, iced water, and other refreshments. To keep drinks at the perfect temperature for long hours, this exceptionally durable beverage dispenser has a removable ice chamber in the center. Thanks to its easy-to-use spigot, this BPA-free beverage server ensures quick and convenient dispensing while its drip tray minimizes mess.